The Sixth Annual White Mountain Double offered a highland and lowland challenge on both Saturday and Sunday. One hundred and forty-six riders put the rubber down on the double centuries. One hundred and twenty-two riders crossed the finish line. 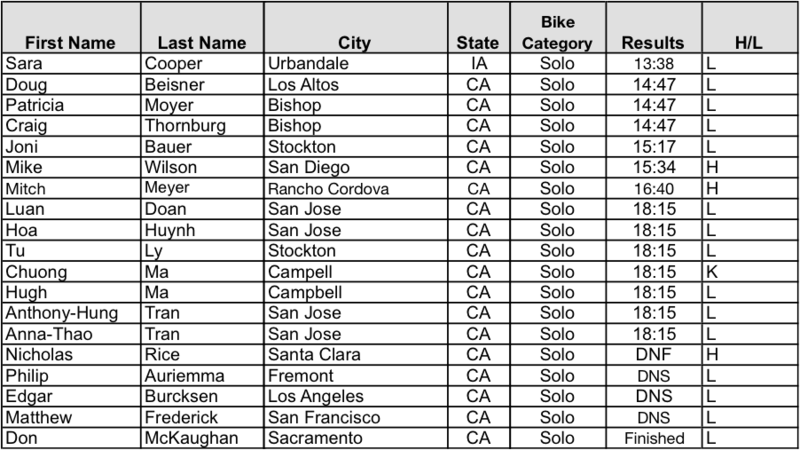 The names of all those that finished are listed below, and those riders that DNF and DNS are also listed. They have the opportunity to come back next year to earn the Winston Churchill Award. CONGRATULATIONS! Aaron on set a new solo course record: 10 hours 53minutes. Aaron of course did the traditional stopped at the Smoothie Shack to enjoy the first smoothie of this year’s ride. Congratulations Aaron on an outstanding performance. CONGRATULATIONS!! Sara dropped the hammer Anne Trason 2010 record by 41 minutes! That’s the way to go Sara… Congratulations on an excellent performance. CONGRATULATIONS!!!! First place finishers!! Sara Cooper on the lowland course and Mike Wilson on the highland course. Great job!! Congratulations!!!! Mike Wilson, the inspiration of the event took first place! Mike comment: “It was harder than he thought it was going to be.” Interesting comment, because he didn’t make it look like it was that hard. The White Mountain Double Century Support Crew did an incredible job providing the best environments possible for such a great challenge. A huge Thank You goes to an awesome group of volunteers who truly make this event better every year! A special thanks goes out to the awesome people at the California Triple Crown, California Highway Patrol, CalTrans at Bishop, Inyo County, Mono County, Nevada Department of Transportation, Hammer Nutrition, Nevada Highway Patrol, U.S. National Forest Service, Dyer Community Park, Manor Market, Esmeralda Market, Satellite Phone Store, M & K Enterprises , and Bishop Waste Disposal. Your ride was one of the best managed rides I did in 2014. Not only was it a great course but the support you were able to give the riders was amazing! Great aid stations/rest stops. All the volunteers were helpful and supportive. I look forward to doing more of your events. This is long overdue, but I wanted to say THANK YOU for the White Mountain Double Century event two weeks ago. First time rider and the climbs literally took the breath out of me. I have to say thank you for the fantastic crew of volunteers and support you assembled, without whose cheerful personalities the ride wouldn’t have been the same. It was a great feeling rolling onto each rest stop with people just cheering us on and anticipating our needs, such as refilling water bottles, handing us ice, soaking towels in cold water, etc. But most of all, thanks for the the really well-thought out course and the strategically-placed and spaced rest stops and aid stations. I initially overestimated myself and underestimated the difficulty of the course, discounting the combined effects of altitude, heat, and hills. I got a chance of riding in the California-Nevada desert with the proper support.